As international experts prepare for the 29 May conference in Stockholm on development aid and debt relief for Iraq under the Iraq Compact scheme, the picture of US policy-making in this area is depressing. 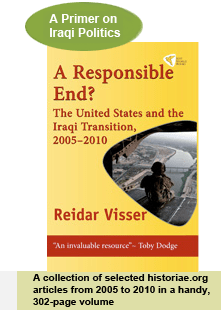 Despite a declared intention of pursuing a unifying policy, through its peculiar choice of Iraqi allies the Bush administration is in fact contributing to fragmentation… Full story here. The Sadrists of Basra and the Far South of Iraq: The Most Unpredictable Political Force in the Gulf’s Oil-Belt Region? Background paper on internal rivalries within the Sadrist movements, and how US policy could affect Muqtada al-Sadr’s strategies in the future… Full story here. Posted in Iranian influence in Iraq, UIA dynamics | Comments Off on The Sadrists of Basra and the Far South of Iraq: The Most Unpredictable Political Force in the Gulf’s Oil-Belt Region?